At our party, there was not as much food as I would have usually liked. enjoy at that point when midnight seems well away and you're yearning for something, anything to soak up the rhum and white wine; a combination which has made a nice little coctail in your ubriacated system. Thankfully I had made a lemon cake, soaked with a lemon syrup which went down nicely with the pinenapple spiked drink. The next morning I learnt that the strawberries had gotten drunk by beer. The consequence of an unfortunate clumsiness. A couple of nights after the party, the figs I'd bought in the market were looking neglected, so I made a fig tart to use them up. Something to look forward to for breakfast, I told my cousin. I bought this book called Le Repertoire des Saveurs (The Flavour Thesaurus) by Niki Segnit. She says that once the figs are very ripe, they reach a honey-like taste, a taste that complements almonds. The light combination creates a nougat-like taste, she tells us. I wanted to re-create this taste. It was late in the evening. Eleven or twelve. Too late to start making tarts. But I got in this state that I often get in when I cook or bake. It's like a fixation, an obsession. It's scary, perhaps. It's a state that I find hard to achieve when people are near. It's a little like meditation- it must be concentrated, it must be precise. There was no sugar in my pate sucrée (ironically.) But you will see in this recipe I have added 50g of icing sugar because it lacked a tad of sweetness. 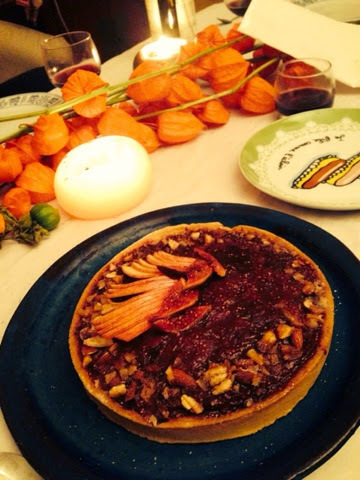 I baked the tart with creme d'amandes in and the fig compote was added later. A few of the prettier figs were reserved for decoration. The figs were tossed in a frying pan and a few tablespoons of sugar were added. Two tablespoons. Or three? Nothing was really measured. I wanted to use sugar like one uses salt and pepper, simply as seasoning, to get the honey taste I was after, a taste that would be crushed by the abundance of white sugar. Pastry was rolled out andcreme d'amandes was made. I was happy with it, and told my cousin that there was breakfast on the table. "We must have a dinner party. We cannot keep this to ourselves." She concluded. The next morning I left the house, breakfastless. So we made another dinner party. It was uncomplicated for a quick mid-week supper. It was intimate and friendly. I used my friends as tasters (testers?) for a well thought out series of fresh vegetarian nibbles centralised around the main element of the dish. The Mushroom. The Fennel. The Onion. The Fig. The Mushroom: Garlic and Cream Baby Mushrooms on french crostini tradition. The Fennel: Slow cooked Butter Fennel with Lemon and Grana Padano. 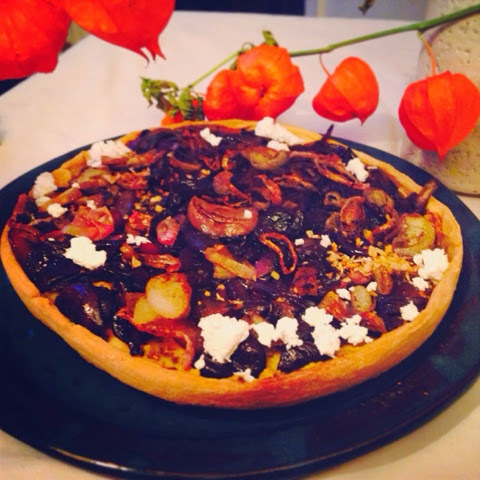 The Onion: Pissaladière (Savoury tart from Provence) Ground olive paste, caramelised red onions, black olives and a light touch of crumbled feta. Crushed and toasted Almonds to decorate. Prepare your pastry in advance. Cream the butter and the sugar add the egg yolk, the pinch of salt and the flour. Reserve in the fridge with some cling film so it doesn't dry out. Cream the softened butter and sugar. Add one egg, mix. Incorporate half of the almond powder. Mix in the other egg. Incorporate the rest of the almond flour and the flour. Prepare your figs by slicing the tops off. Put in a pan with the sugar and once it is at a hot heat add the wine. Put at a medium - low heat and allow the figs to cook and the wine to reduce. 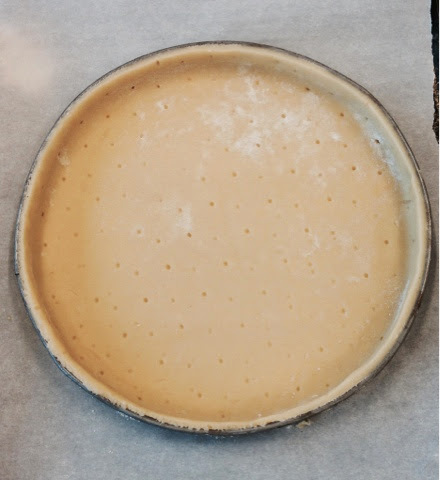 Roll out your pastry and spoon in the creme d'amandes neatly. Cook at 200 degrees C for 15- 20 minutes, or until the pastry is golden brown. Once the pastry base is cool, spoon in the fig compote. Decorate with figs and crushed almonds. 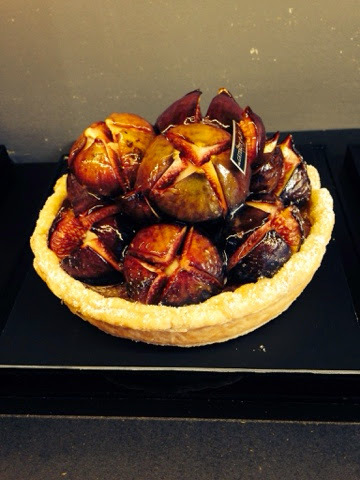 This photo is a fig tart at "Des Gateaux et du Pain" a patisserie on rue du Bac. I thought it would be interesting to post this photo for decoration ideas. And also because I am on the subject of fig tarts, of course! What is your favourite tart? I would love to hear your suggestions! 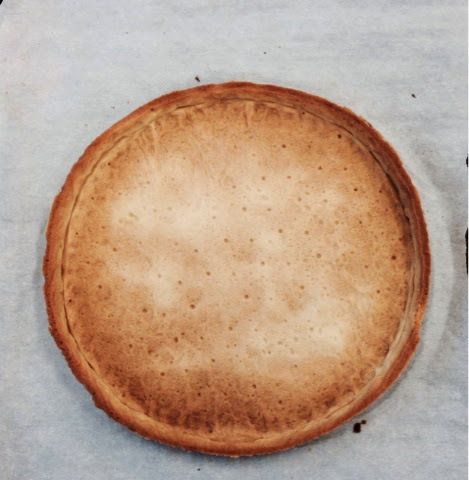 Posted on September 28, 2014 by Abigail Scheuer- Sarne and filed under paris and tagged recipes pastry pastrylife inspiration2.